Really Rocket Science » Blog Archive » Love Falcon 9! 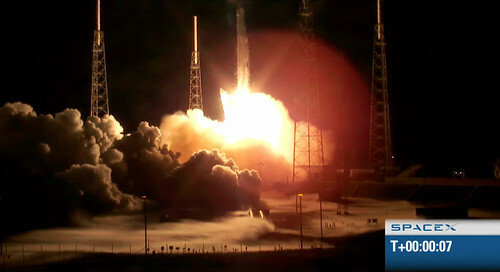 Today, Space Exploration Technologies (SpaceX) successfully launched its Falcon 9 rocket carrying a Dragon spacecraft to orbit in an exciting start to the mission that will make SpaceX the first commercial company in history to attempt to send a spacecraft to the International Space Station — something only a handful of governments have ever accomplished. At 3:44 a.m. Eastern, the Falcon 9 carrying Dragon launched from SpaceX’s launch pad at the Cape Canaveral Air Force Station. Now Dragon heads toward the International Space Station. On that journey it will be subjected to a series of tests to determine if the vehicle is ready to berth with the station. We’re hoping the mission keeps on succeeding! This entry was posted on Tuesday, May 22nd, 2012 at 12:53 pm	and is filed under Rockets & Launches, Space Business. You can follow any responses to this entry through the RSS 2.0 feed. You can leave a response, or trackback from your own site.